• Early Bird Discount Rate – $1759 ($200 savings) if registered with deposit by June 31st. Mary Meighan, a native of Ireland, is the founder of Celtic Journeys whose mission is to offer soul journeys steeped in the Celtic traditions of pilgrimage, retreat, and ritual. She has traveled to sacred sites across Ireland for decades — renewing, sustaining, and sharing her passion for the Celtic world. She also visits the U.S. and other countries introducing the Celtic Spirituality through talks, workshops and retreats– drawing upon the inspiration of Irish poets, storytellers, scholars and traditional musicians. Sean and Mary have been friends for many years and have guided a number of retreats together in Ireland. They are excited to share this one-of-a-kind immersion in Celtic spirituality. Sean Johnson is a singer, storyteller, and teacher of spirituality and yoga. He is the founder of Wild Lotus Yoga, Soul School Teacher Training Program, and The Wild Lotus Band. Sean’s love of Ireland and Celtic Spirituality goes back to his youth, and in college he did an intensive program in Irish Studies. He has traveled to Ireland over a dozen times. The sample itinerary below gives you a feel for how our days will flow and the kinds of experiences included in the retreat. Schedule may shift in the flow of the week. Each day we will have a Celtic Gathering that begins with songs and chants to tune your spirit to the Celtic world. Our gatherings are ways to draw you deep into Celtic Spirituality, a way of experiencing the world that is ancient, yet very much alive. This time will give you an internal understanding and feel for the Celtic Tradition – a world filled with mystery and natural wonder. We’ll share poems, music, stories, chants, blessings and prayers of this ancient land allowing the Celtic Spirit and mystery to stir your imagination and nurture your heart. Day One Monday. We will meet you at 11:30am and give you a warm Irish Fáilte (welcome) in the small ferry port on Inis Mor Island, County Galway. We will go by bus to our Guesthouse which sits at the foot of Dun Aonghasa (A World Heritage Site) where the retreat will begin. Settling-in time at our welcoming family run guesthouse, then a break for lunch. Day Two Tuesday. Here we are on this wild and beautiful Gaeilge (Irish) speaking Island. We open the day with an early morning silent pilgrimage walk up to Dún Aonghus Fort (weather depending). Here you can experience Celtic morning Chanting for the further opening of our hearts to the Celtic Spirit. Aonghus is the Celtic God of love and poetic inspiration and the fort is perched spectacularly on a cliff overlooking the Atlantic ocean….. next stop the USA. Receive a Water Blessing from the Holy Well of Surnaí, a Celtic Woman Saint from the 6th century who had a Monastery here on Inis Mor. 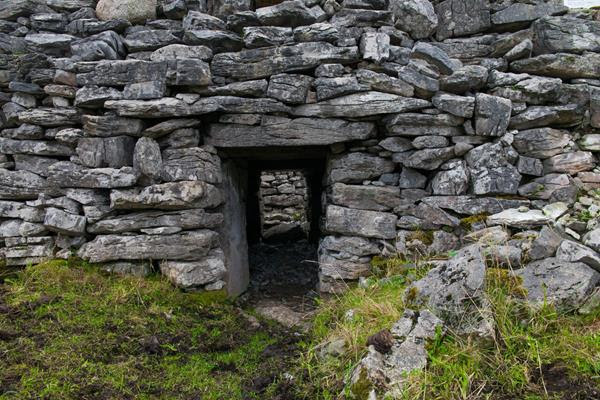 As you receive water from Her Sacred Well here on Inis Mor, tune in to Her energy. Walk back down to our guest house for breakfast and then time for taking a breath. Singing from the heart is one of the most cherished experiences in the Celtic world. Gather in the afternoon for a session of Irish songs and stories guided by Sean. Dinner and traditional Irish music, experiencing the culture and conviviality of a local Irish pub. Day Three Wednesday. We’ll have a morning gathering to further unfold the natural gems of the Celtic Tradition. You’ll be introduced to the Celtic Calendar and how we can live more within this circular sense of time and within the seasons. Be introduced to the Spirit of Brigid – our beloved ancient Goddess and Celtic Saint, The Divine Feminine of Ireland. Learn the importance of Brigid in the heart and soul of Ireland. Hear some of the myriad of stories, poems, songs, blessings and Chants about Brigid. Be part of a Brigid Ritual that is heart easing, heart warming and will fire your imagination. Receive a Water Blessing from Brigid’s Goddess Well. Hear about our Celtic Practices, opening your hearts to these, simple, yet powerful Celtic rituals and experience how you can bring them into your daily life to nurture, support and inspire…..
A little reflection time and a lunch break. More of this island’s sacred treasures await us for the afternoon when we will meet a Celtic Monk living on Inis Mor since 1985. He has a deep connection to the Island and he will bring us to some of the sacred sites of Inis Mor, sharing the stories of these sacred places.We will first have a tour of part of the island and later in the day at one these Sacred Sites you will be guided in a traditional Celtic Ritual and receive a Water Blessing at a Holy Well. Dinner at the guesthouse followed by a gentle yoga session and Celtic lullabies. Day Four Thursday. We will have shared with you how the very nature of Celtic Spirituality offers a guiding hand to turn gently within, offering you guidance to assist you on the inner journey within the Spirit of the Celtic Wisdom Tradition. This island offers peace and an expansiveness to journey deep within and as we are about an inner journey as well as an outer journey Celtic Spirituality offers the encouragement and inspiration. Relax and let this sacred landscape nurture and fire your imagination. You can walk to the beautiful nearby beach, walk up to Dun Aonghus, bicycles can also be hired to explore other parts of the island, journal, or sit and be on this sacred island of wild beauty and what this Sacred Journey is offering you. Late afternoon Celtic meditation together in the remains of an ancient Celtic church. Evening meal together at the guesthouse followed by an Irish ceili- an evening celebration together with participatory songs, dance, stories, and sharing. Spaces limited. The retreat is set up for an intimate group to attend so early registration is highly recommended to reserve your spot. Register with $700 non-refundable deposit. Full balance due by August 1st. • Currently Booked Up. Wait List Available. Early Bird Discount Rate – $1759 ($200 savings) if registered with deposit by June 31st. • Regular Price – After June 31st: $1959. Travel insurance is recommended. No refunds. Price includes daily retreat sessions with Mary & Sean; four nights accommodations at an 18th century family-run guesthouse with shared accommodation (Limited number of single rooms available for an extra $70 per night – $280); four hearty Irish breakfasts; lunch on the opening day; three homemade dinners at our guest house; buses on Inis Mor to and from the ferry port to guesthouse; bus excursions on the Island to sacred sites; and local guide. Price does not include airfare, ferry, and meals not listed above. For those traveling to Ireland for the first time, Ireland is an incredibly hospitable place for visitors and easeful place to travel compared to other countries. The 5 day length of the retreat on Inis Mor offers a cushion of some time before and after the experience to have your own adventures on the mainland. It may not be possible for everyone, but if you have the freedom to arrive in Ireland a couple of days early, it can be helpful to adjust to the jet lag and rest before the retreat begins. Similarly if you have the flexibility to stay in Ireland a few days after the retreat, you will find the retreat to be a wonderful immersion that will bring greater depth to your travels and adventures in Ireland afterwards. Below is some advice for traveling. On Monday September 30th, please arrange to catch the 10:30am ferry from Ros a’ Mhíl (Rossaveal in English) to Inis Mor. We will meet you at 11:30am at the ferry landing on Inis Mor. From Galway City there are buses that will bring you out to Ros a’ Mhíl (Rossaveal in English) but as it is a Gaeltacht area the road signs are in Irish. Ros a’ Mhíl is 23 miles west of Galway City and return shuttle bus from Galway and back is 7 Euro and the Ferry cost is 25Euro return. The bus takes about one hour from Galway City to Ros a’ Mhíl. All details regarding the ferry and the shuttle bus from Galway City are on the website www.aranislandferries.com. Just to be aware it is not a car ferry – as cars cannot drive onto the Island. The only cars on the island are islanders’ cars and small buses. From Dublin airport: (Dublin is on the East coast of Ireland and Galway is on the West Coast). If you do fly into Dublin you need to allow time to travel to Galway City (approx 3-4 hours) and then on to the Ferry Terminal. Travelling to Galway from Dublin can be by bus or train – and obviously car hire is available at the Airport and in Dublin City. www.irishrail.ie has all the details of fares and timetables of trains from Dublin City to Galway City. Buseireann is the national bus company and their website www.buseireann.ie has all the details of fares and timetables between Dublin City and Galway City. There are also many private bus companies that travel between Dublin City and Galway City.